This is the first game in the Master of Orion series. For other games in the series see the Master of Orion category. 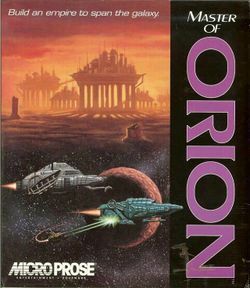 Master of Orion (MOO1) is the first in the Master of Orion series. It was developed by Simtex; Steve Barcia and Ken Burd designed it. The game was designed to use MS-DOS and was published by MicroProse in 1993. Most reviews by critics and players were very favorable. The game begins with a single colonized homeworld, a colony ship, and two scout ships that can be used to explore nearby stars. As the game progresses, new worlds are discovered, other races encountered, worlds colonized and wars fought. Despite their different backgrounds and homeworlds, all races possess legends of the Orions, a master race that once controlled the galaxy, and their protected homeworld containing powerful secrets and technology. The homeworld is found in the Orion star system and is defended by a powerful robotic starship, the Guardian. Master of Orion 1 and 2 can be purchased at gog.com. This page was last edited on 14 March 2018, at 20:53. This page has been accessed 75,883 times.